Microfinance is a form of financial services that lends money to extremely low-income individuals, who typical do not have access to typical bank lending options. The loan (microloan / microcredit) is generally used to start or expand a small business. The recipients microloans are often fairly new entrepeneurs that have a 1-3 person business. Typically microfinance loans are $100 or less. This dollar amount varies by the geographic location of the recipient and the investment project. I have seen loans that range up to $1,000 or $2,000. This can be for two reasons. This is a pooled investment with more than 1 loan recipient. Often, microfinance projects will focus on a specific type of investor. For example one project could be investing in small farmers in a specific region. Therefore each individual farmer would receive a small loan, but the project would aim to help many farmers. How is Microfinance different than donating to charity? When a donor gives money to charity, administrative fees are taken from the donated money, in order to cover operating expenses. The donated money that is left over is dispersed to recipients. Recipients use the money and the process is complete. When a person invests money in microfinance, administrative fees are still taken from the donated money, in order to cover operating expenses. However the money that is dispersed to recipients is a loan. Any recipient of microfinance, must pay back the money they were given. 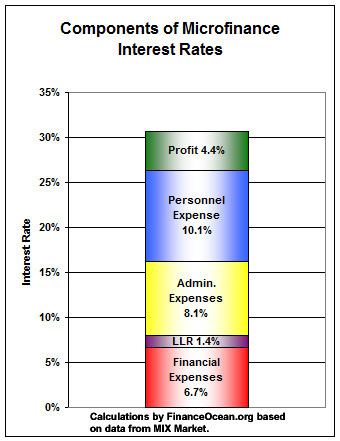 In addition, recipients are almost always charged interest on the loan. The payback is similar to any other type of loan (ie: credit card, car loan, home loan). Generally the loans have a payback period of a couple years, however this varies depending on the project. On average, microloans charge 30% interest. (1) This rate may seem extremely high. It is comparable to the high-end of US credit card rates. However, the alternatives to microloans warrant this type of interest. Recipients of microloans would not be approved for a typical bank loan. Without the ability to borrow from banks, potential recipients are left with few credit options. Credit options that exist are extremely expensive. Take the inhabitants of Dharavi, India as an example. Low income inhabitants of this area will typically pay 600-1000% interest per year for credit (Professor Sridhar Balasubramanian, MBA 741, UNC Kenan-Flagler). Moreover, the cost of making and servicing microloans tends to be high. 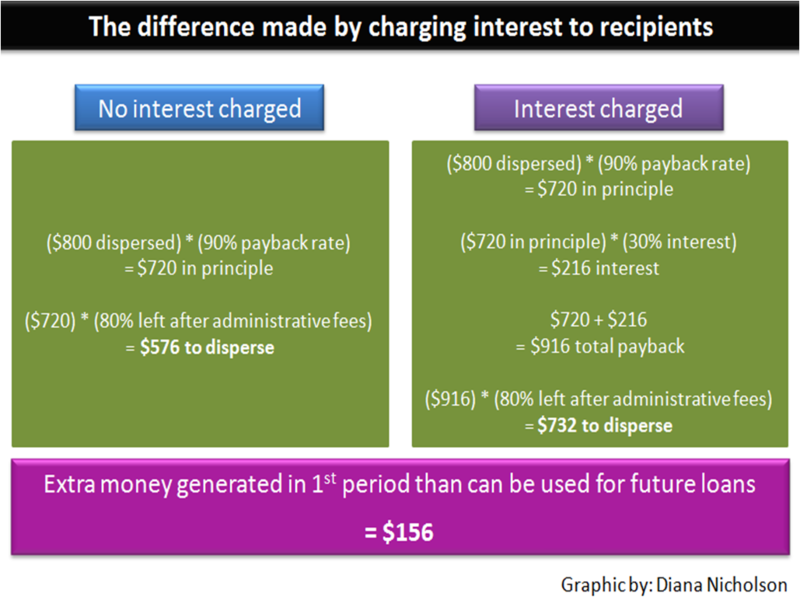 As you can see, in the graphic to the right, almost all of the interest rate charges are used to cover the costs of the loan. By charging an interest rate, microlending groups can ensure that the original money used to finance the loan can be reused for future loans. You may be thinking, “Why would I invest in a group that is going to charge recipients money, when I could just donate to a charity?” Well microfinance is cool because if it is done right, the original money can help many more people than a charity donation would. 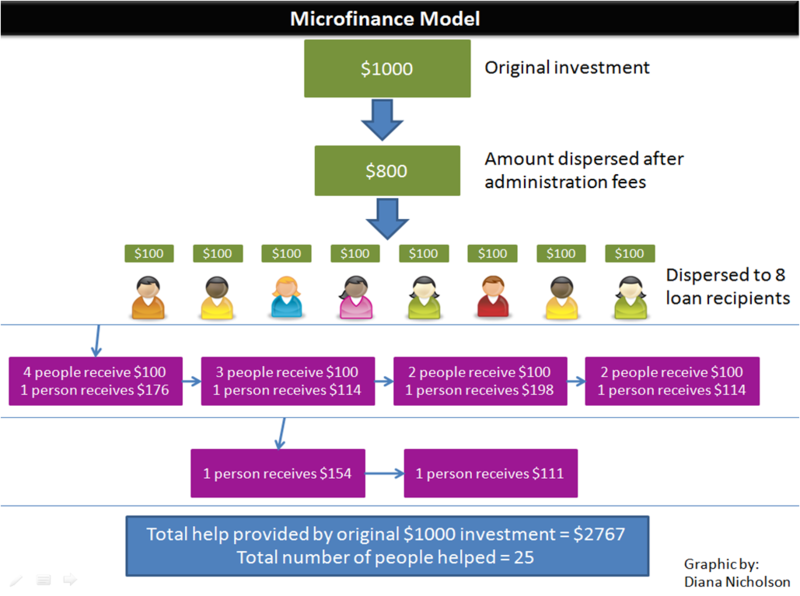 The microfinance model is set up to be self-sufficient. Lets use the example of a $1000 contribution. Assume that both charities and microfinance organizations have a 20% administration cost. Also assume that each recipient must receive at least $100. This means that 20% of the funds that get contributed, go towards paying costs of the organization. Therefore, in either case, the original $1000 contribution becomes $800 of distributed funds. In the case of charity, the $1000 donation has just improved the lives of recipients by $800. In total the $100 has helped 8 people. Across the board, microloans have a payback rate of 90%. For example, if funds are distributed to 10 recipients, 9 of those recipients will pay back the loan. However, because microloans are paid back, that same $1000 contribution becomes $2767 of distributed funds. This is $1967 more than with charity. Moreover instead of helping 8 people, 25 people have been helped. Now if that same microfinance group charges 30% interest, most of the money that is lost in administrative fees and loans that did not get paid back, is recouped by the interest. 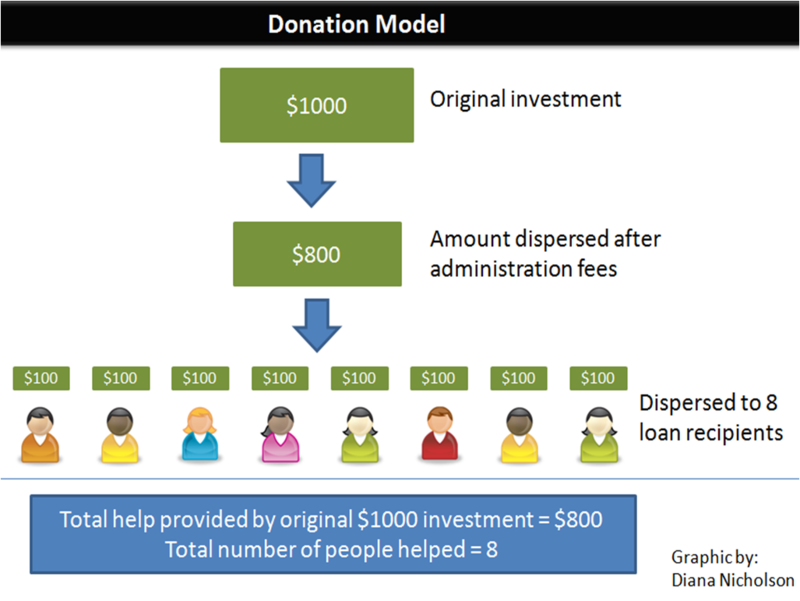 Therefore, the same $1000 original contribution becomes $10,994 in distributed funds and helps 115 people. There are many great microfinance companies that individuals can contribute to. Some of the ones I have heard of are: Kiva, Accion, and Micro. However, I think the idea behind Microplace is great because the investment you make there pays interest to the investor. For example, if you invest $1000 in Microplace, you will earn 1%-3% interst per year on the investment. So, assuming the loan is repaid, at the end of the year an investor would have made $10-$30 in interest. This money, in addition to the repaid principle, can either be cashed out or reinvested in another loan.Why is that so great? If you chose to reinvest, you can help more people than with other organizations, without adding more of your personal money. If you chose to cash-out the investment, you made money. Although man kind can be giving in nature, man kind tends to be more giving when the personal benefit of giving is greater (ie: make a little interest on the side, or have the ability to keep investing larger amounts of money without having to decrease one’s personal budget). This is a social responsible investment. Even if someone wants to earn a little interest on their savings, they can do so while helping the world at large. This opens up the opportunity of helping, to individuals who are counting on the personal savings for future need (ie: people who would probably not donate the same money to a charity or donate it to a normal microfinance cause). In essence, by paying investors a small amount of interest, Microplace increases the amount any individual investor may be willing to contribute and expands the pool of potential investors. Both of these lead to a world of microfinance that can grow faster and help more people.In addtion, Microplace still allows investors to choose what type of investment they would like to make. The site includes options on social cause contributed to, rate of interest, repayment schedule, diversification of fund, and geographic region. Investments can be as small as $20. How does Microplace compare to other investments? Rates: Depends heavily on your investment choices. Average 11.9%, however has been lower during the crash. Terms: No set term. Generally advised expect at least a 5 year investment, in order to prepare years of bad returns.